In today’s world of constant connection, sitting behind the wheel of a car with little access to a cell phone can prove difficult for many drivers. Calls, texts, music, and GPS services are a large draw and one of the reasons that cell phone use is one of the largest causes of distracted driving. Are you interested in kicking the habit? Find our top 5 tips and tricks for reducing distractions while driving below. The best way to ensure that you aren’t tempted to pick up your phone while driving is to keep it tucked away out of reach and on mute. Whoever is calling or texting can wait for you to arrive at your destination. Most newer phones have settings that can mute calls and texts if you are using your phone for directions and some will even reply to texts with a prompt about how you are currently behind the wheel. Advance preparation is key when it comes to staying focused behind the wheel. Get in the habit of getting your navigation settings, playlist, and climate control all squared away before you even leave the driveway or parking lot and you will have a lot fewer reasons to reach for those distracting driver controls while on the go. 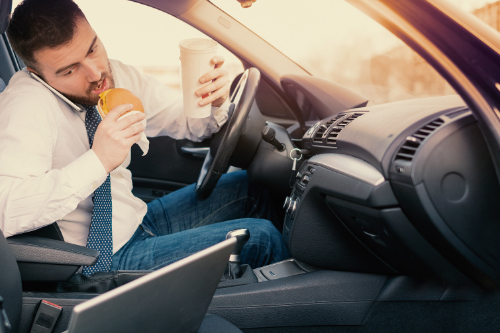 Like cell phone use, eating while behind the wheel is a serious problem that leads to distracted driving and accidents every day. When planning your schedule, leave yourself plenty of time to grab a meal or a snack before you hit the road, so you aren’t tempted to grab something to eat on the way. If you do need to visit a drive-through, take a few minutes to chow down in the parking lot before heading back out on the road. Drowsy driving is hazardous driving. If you do end up feeling tired while driving, see if there are any passengers who would be willing to take over. If not, pull over at the nearest safe space like a gas station and get out and stretch your legs. This can help wake you up and keep you alert. If you’re still tired, consider stopping for the night at a local hotel. Do you have any bad driving habits that leave you less than focused when behind the wheel? Now is the perfect time to adjust your routine with our tips and tricks for safer road travel for all. This entry was posted on Wednesday, January 23rd, 2019 at 8:51 pm	and is filed under Tips and Tricks. You can follow any responses to this entry through the RSS 2.0 feed. You can skip to the end and leave a response. Pinging is currently not allowed.